Ever since my uncle headed back to Hong Kong, I haven't seen him as much as I would like. With the impending one-month birthday of his grandson, he made his way back for a brief visit. We had already had lunch at Shanghai River and then the one-month banquet at Victoria Restaurant. So, I thought to myself, "self, why are we eating at Chinese restaurants when he lives in Hong Kong?". Sure, the Chinese food in Vancouver is very good, but c'mon, he can eat Chinese food anytime he wants! Hence, I decided to treat him for brunch instead. 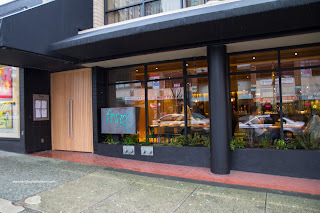 Ultimately, I decided on Forage, partly because it I've never been there before and partly for its reasonable pricing. 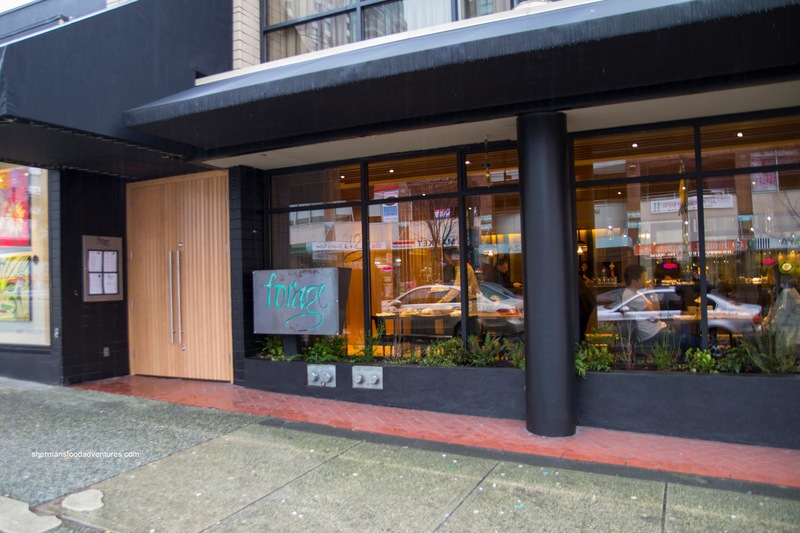 For a relatively and centrally located restaurant in Downtown, most items hover around $12.00 (and also considering the fact they adhere to a sustainability philosophy). Despite having a main dish in mind already, I couldn't resist ordering the BC Spot Prawn and Seafood Chowder with soft-poached egg, smoked chicharrón and pork hock. 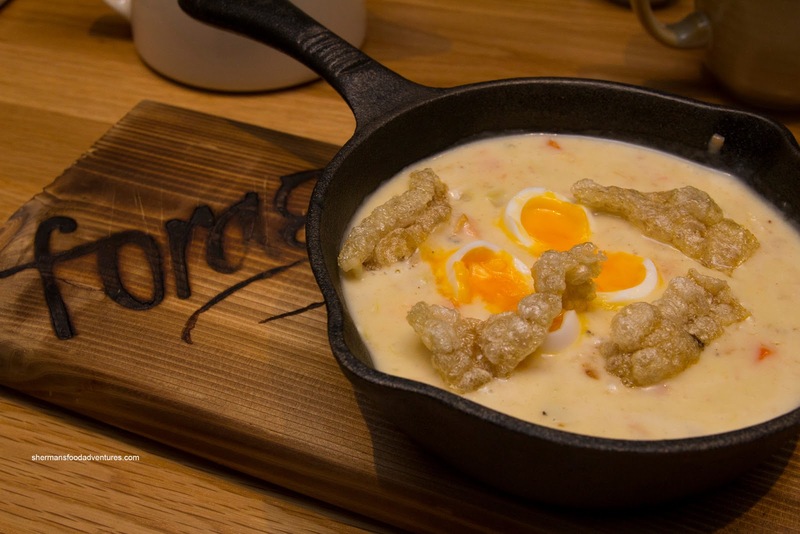 This was an ample portion of creamy chowder served in an iron skillet atop a branded wood plank. Diet food this was not. The runny eggs were a luxurious addition to an already rich concoction. I liked how there was a smokiness from the smoked cod and saltiness from the pork hock. However, the pork cracklings were a little hard and did not offer up the textural contrast I was looking for. 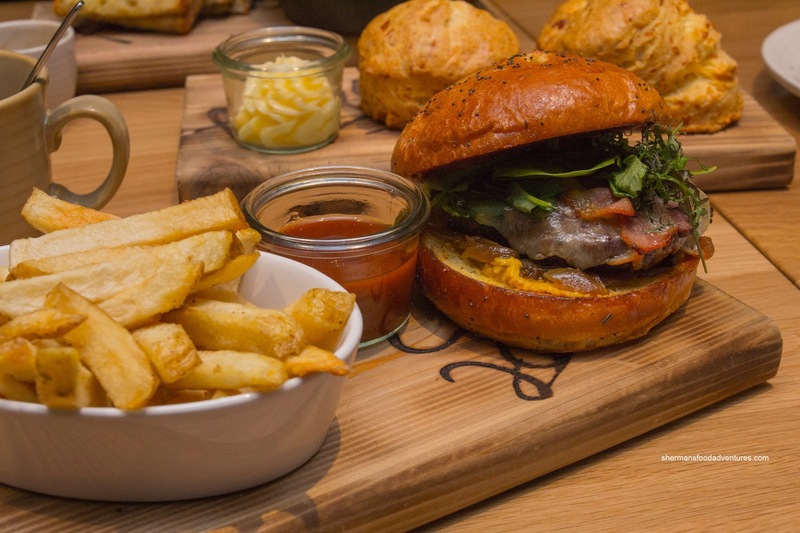 For my main, I had the Rangeland Game Burger with caramelized onion preserve, house-cured bacon and Golden Ears cheddar served with fries. I really liked the burger patty as it was super moist and just barely cooked. There was a pleasing gaminess which was accented nicely by the sweet onions and mustard (which cut some of the gaminess). The poppy seed brioche bun held up to the ingredients and was light which didn't get in the way of the other ingredients. Although the fresh-cut fries were not as crispy as I would've liked, they were still pretty good. 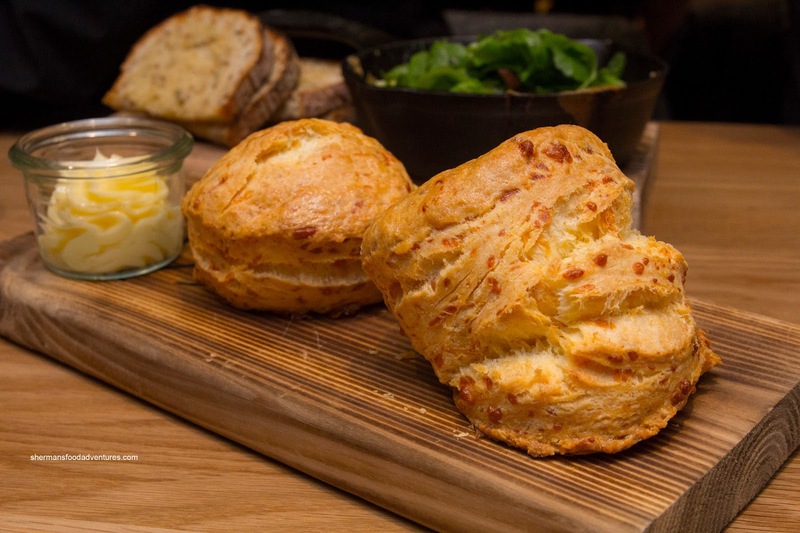 As if this wasn't enough food already, I added a side of Fresh Cheddar Scones served with honey butter. These were straight from the oven being cheesy, soft and warm. The addition of the honey butter was icing on the cake. My dad decided on the Alpine Juniper Duck Confit Frittata with Neufchåtel, roast garlic and arugula. 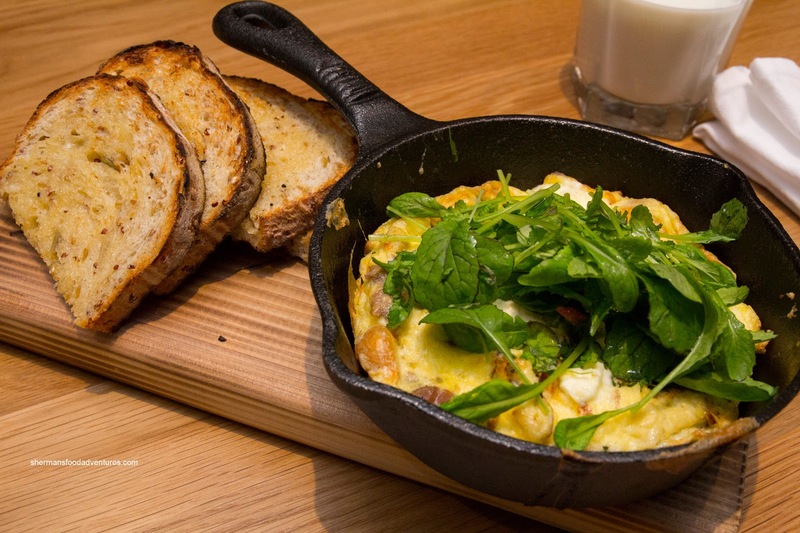 The edges were really crispy while the overall texture was a touch rubbery, however, the frittata as a whole was decent. The duck was moist and flavourful while the Neufchåtel was there, but not overly so. As much as the multigrain toast on the side would normally be overlooked, this was not the case here. The fresh bread was very good and toasted up nicely. 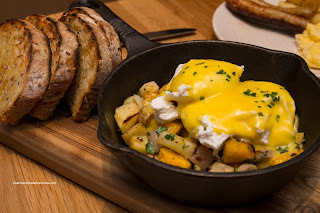 Viv had the Two Rivers Turkey Sausage Hash consisting of autumn vegetables, free-range eggs and mustard Hollandaise. It was evident from the first bite that there was not a whole lot of sausage in the hash. We could only pick out a modest amount of super thinly-sliced sausage from the mix of veggies. Therefore, the flavours were mild and it became more of a light veggie hash than anything else. The perfectly poached eggs and solid Hollandaise saved the dish though because it was the much needed body that the veggies needed. 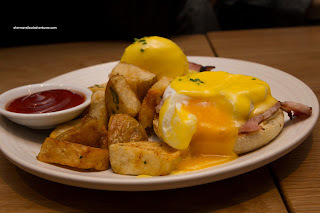 We liked the zing in the velvety Hollandaise (which would probably be from the mustard and lemon). like his style!). It included valley blueberries, honey butter and maple syrup. They were aesthetically-pleasing to look at with a nice shade of brown. The best way to describe these would be "fluffy enough". What I mean is that they were not exactly super-fluffy, but hardly dense either. So somewhere in the middle. 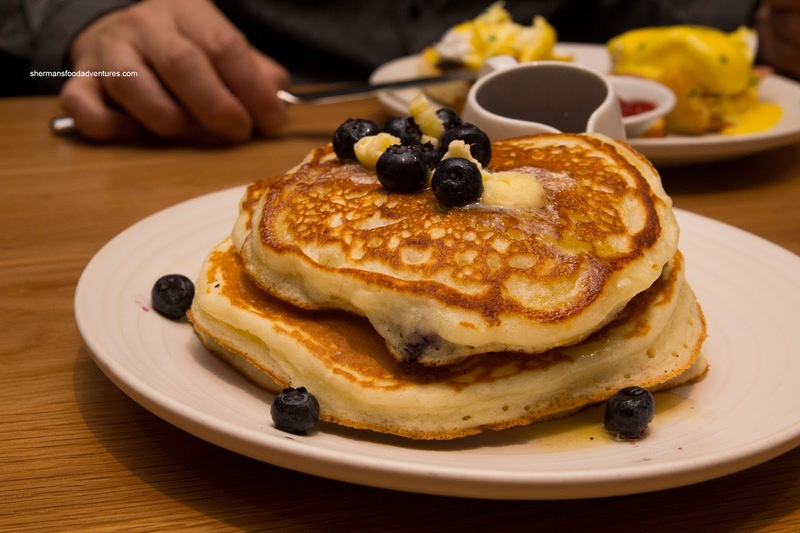 Hidden inside each thick pancake was a plethora of sweet blueberries. Lastly, the kids shared the standard breakfast plate consisting of Two Free-Range Eggs, crispy potatoes, toast and sausage. We also got a side of bacon because my daughter loves it. That a girl! A food-lover in the making! 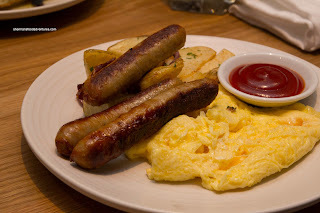 Although the plate wasn't exactly big, the inclusion of 3 lean turkey sausages made it a hearty breakfast. The scrambled eggs were nicely done - barely cooked and fluffy. Overall, we thought our brunch was above-average and well-priced (with all things considered). We agreed that a return visit (for dinner) is imminent.